We Need To Talk About Kevin Movie Trailer. Tilda Swinton, John C. Reilly, Ezra Miller star in the psychological thriller. See the movie trailer for ‘We Need To Talk About Kevin’. The film, tracks the mother-and-son relationship from the beginning, as an unresponsive infant and toddler grows into a sullen, violent, frighteningly remote teenager — all while his oblivious father looks away. MPAA Rating: (R) for disturbing violence and behavior, some sexuality and language. 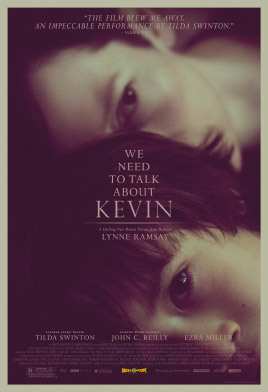 A suspenseful and gripping psychological thriller, Lynne Ramsay’s WE NEED TO TALK ABOUT KEVIN explores the fractious relationship between a mother and her evil son. Tilda Swinton, in a bracing, tour-de-force performance, plays the mother, Eva, as she contends for 15 years with the increasing malevolence of her first-born child, Kevin (Ezra Miller). Based on the best-selling novel of the same name, WE NEED TO TALK ABOUT KEVIN explores nature vs. nurture on a whole new level as Eva’s own culpability is measured against Kevin’s innate evilness. Ramsay’s masterful storytelling simultaneously combines a provocative moral ambiguity with a satisfying and compelling narrative, which builds to a chilling, unforgettable climax.